Most of us don’t even think about electricity and how it affects our lives. As long as we pay our bills, the electricity is there. We’re free to watch the news in the morning while we wait on our coffee pot to finish before we take or hot shower. All of these things provided by the electricity which we take for granted. Everyone has some sort of preventative maintenance routine for their vehicles, their lawn care equipment, and even their plumbing. Most people, however, do not have a preventative maintenance plan for their home’s electrical system or devices. 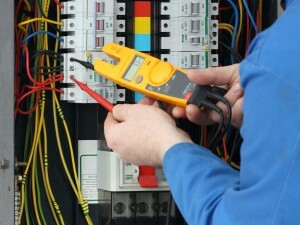 A problem with your home’s electrical system could turn into a costly repair, or worse yet, a major hazard. In addition to scheduling a yearly inspection by a licensed and certified electrician, there are some steps that you as a homeowner can take to keep your home’s electrical system in perfect form. Even though a majority of homeowners prefer to handle minor home repairs, you should be VERY cautious when working with electricity. You MUST know how to turn off the power to a light fixture or appliance before you begin work and you should always test to make sure the power is really off as switches at the box can be mislabeled. If you are not absolutely sure how to do both of these things, then don’t take a risk, call Laudan Electric, Inc at (239) 369-8884 and schedule service right away! Only use extension cords as a temporary solution. Do not place power cords under rugs, carpets or furniture. Buy products which meet the Underwriter’s Laboratory (UL) standard for safety. Install smoke alarms outside bedrooms and once on each floor. Turn appliances off before plugging them in. Keep electrical appliances away from wet areas. Keep heaters and halogen lamps away from draperies and other combustible materials. Use only three-slot outlets for appliances with three-prong plugs. Use safety devices to help child-proof outlets. Don’t turn a circuit back on before identifying why it was turned off. If you discover any of these items, make sure to take action immediately. Test and replace smoke alarm batteries every year. Replace frayed, cracked or cut power cords immediately. Replace an item that causes overheats, shorts out or produces smoke or sparks. If a switch or outlet is hot or discolored by heat buildup, immediately shut off the circuit. Shut off power to the circuit and fixture you are working on. Never assume the circuit is off. Use a tester to confirm there is no power before starting work. Always use an insulated fiberglass ladder when doing electrical work. Avoid working in wet areas; wear rubber boots and gloves to reduce risk of getting shocked. Plug tools into a GFCI outlet or GFCI extension cord if you must work near water. Dry your hands before grabbing any cord to plug/unplug it. When working at the service panel or turning off a circuit, leave a warning label.